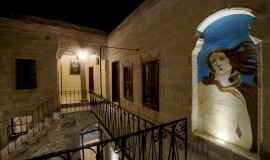 The Henna Hotel are located in the old part of Goreme, less than a five minute walk from the town center. There are buses from all the major cities of Turkey to Goreme or Nevsehir. Be sure to buy your ticket to Goreme, not Nevsehir. Some travel agencies in Nevsehir bus station will claim that they will transfer you to Goreme free, but they will hassle you to purchase tours and leave you there if you don't buy one. Major companies like Metro and Nevsehirliler will have service buses from Nevsehir to the Goreme bus station. Just as with flight tickets, Turkish Heritage Travel can also book bus tickets to Cappadocia. We pick our guests up from the bus station in Goreme for free of charge. Please give us a call from the information office in the Goreme bus station. Even though the officers know our number, for your records, our phone in international format is +90 384 271 3125. We will come and pick you up in less than 10 minutes and drive to hotel. If you would like to walk, we have placed many signs from bus station to the hotel. Our hotel is less than 500 meters from the bus station.